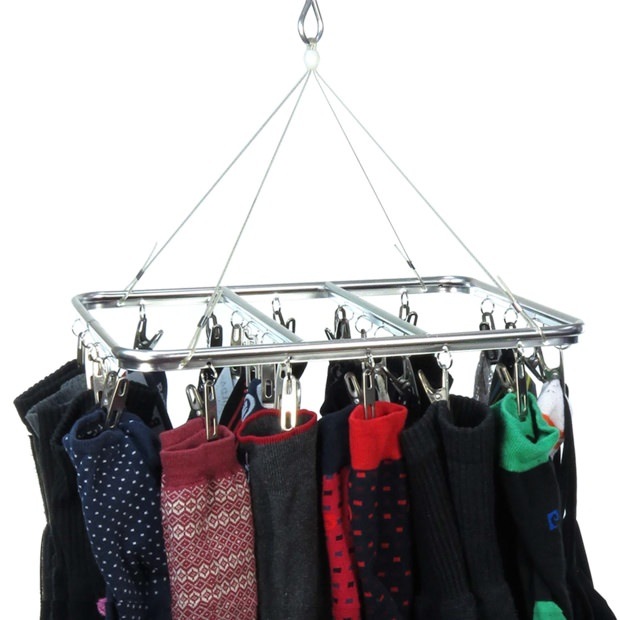 Stylish, polished aluminium 26 peg hanging dryer for use indoors and outdoors. Rust resistant with strong grip pegs. A great way to dry smaller laundry items together. Ideal for drying socks, underwear, vests, baby clothes and other small items. Central large hook for versatile hanging throughout the house and on the washing line. Metal wire reinforced supports for strength. Easily bring in your small items from the washing line in one go when it starts raining! Perfect for caravanning, camping and travelling too. Size: Length x Width 14'' x 11'' (36cm x 28cm) approx. Having owned 2 plastic hangers that have gradually fallen apart I thought I would try something better. These appear to be well made and should last a long time. More expensive than plastic but should be worth it. For years I had been using flimsy plastic sock hangers which always broke! This excellent, fit-for-purpose hanger is quality and will last a very long time. Great value-for-money purchase. Excellent Solution for Socks, Etc. Although lightweight, this dryer feels well-made and is easy to use. The pegs are much sturdier than plastic ones and it's easy to hang inside or outside. Recommended! I wanted a hanger for socks and smalls and after reading many reviews and researching the best for me, I chose this one and I am so glad I did. A clip to make absolutely sure it stays on the line on a windy day would be good, and there are some holes around its edge which were a bit jagged, but a quick buff with a nail file quickly removed the burrs. However, despite these minor issues, this hanger is fantastic, in a completely different league to cheap plastic ones, and just the right size for our family of 3. In fact, I bought 3, one to keep for inside drying, one for outside and one for my mum who I'm sure will love it too! Fingers crossed it won't rust, but it doesn't appear so.